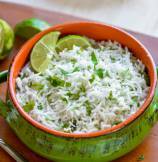 Sharing today a simple yet flavor-packed rice recipe - Cilantro Lime Rice. 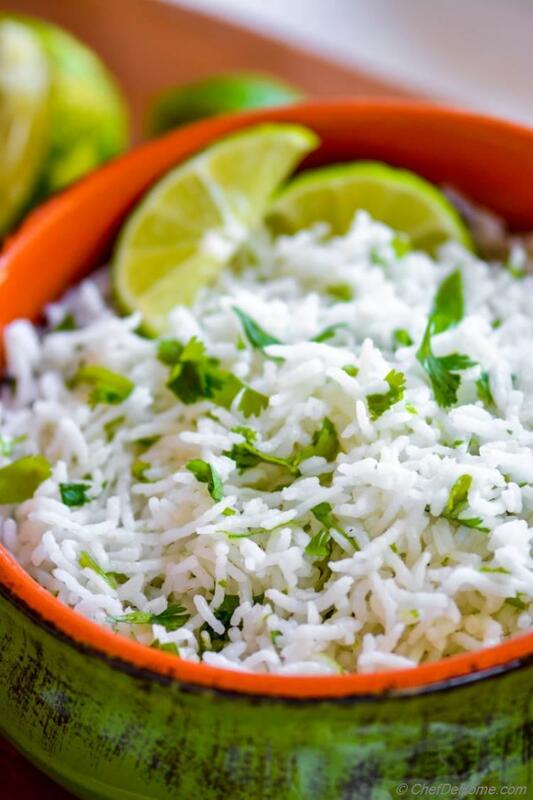 You will be surprised to know how much flavor a little lime and cilantro can bring in a bowl of plain old rice. 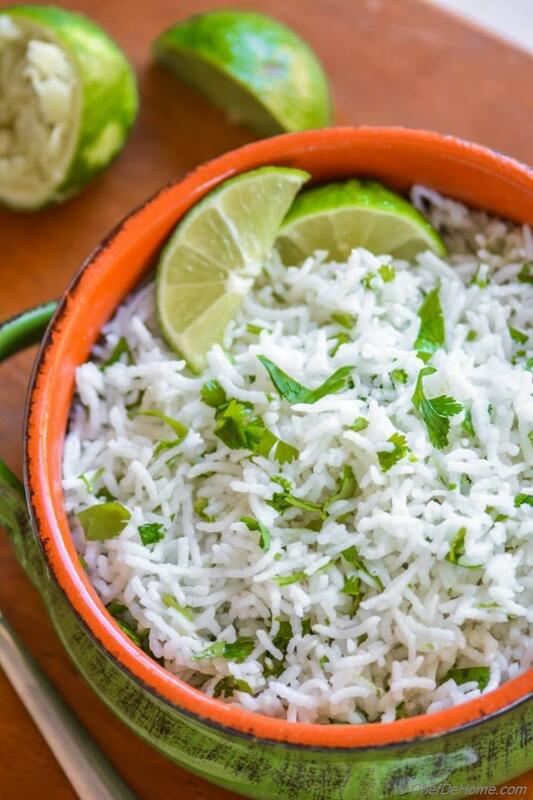 Whether you have leftover rice in refrigerator or made some extra for tomorrow's lunch.... follow a 5 minutes recipe to make'em extra delicious with tangy lime and herbaceous touch of fresh cilantro! Rice are perfect plain canvas to paint-on any flavor-color you want. My family loves rice so much... I always keep finding ways to make'em special. 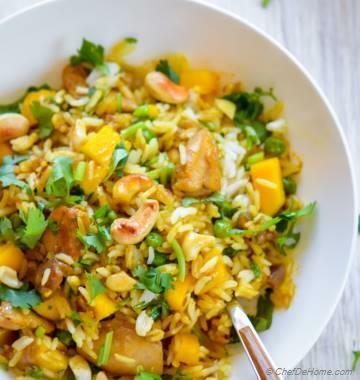 Other than Cilantro-Lime rice, Tomato Rice and Lemon-Curry Rice are often in my dinner menu. I promised to give you all recipes of chipotle so that you can enjoy a great Mexican meal at home, under budget! This post also goes towards keeping that promise. However, Chipotle's cilantro rice does not have that good (or say no) lime and way more oil. I like to use less oil and some lime juice to balance the flavors of rice. Hence, I'm not calling it Chitole's Copycat recipe. Yet, I know you will love'em more than Chipotle's Cilantro Rice! I promise! Myth - Best Rice need Rice Cooker! Honestly, this myth.. I'm happy to prove wrong. Every rice recipe on this blog has been cooked without Rice Cooker. However, rice cooker is a good tool for anyone new to cooking, or if have no time to spend in kitchen. In all other cases, simple plain rice are best when boiled with good friend "water" and some seasonings (if preferred). So whenever I can spare 12 minutes (Basmati Rice) or 15-17 minutes (other most thick rice varieties), I opt to boil the rice with 1 cup extra water. This not only gives me option to move around as rice will not catch at bottom of pan due to water evaporation... Also, I drain the extra water to get ride of a lot of starch from rice. This makes less-starchy, lite, fluffy rice, perfect for everyday consumption. 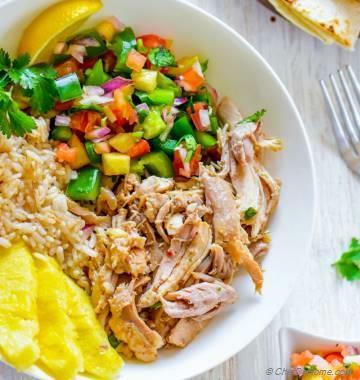 I became fan of these flavors - cilantro and lime, in rice when I started exploring Mexican cuisine and specially when I became fan of Chipotle's Cilantro Rice and Sofritas bowl. 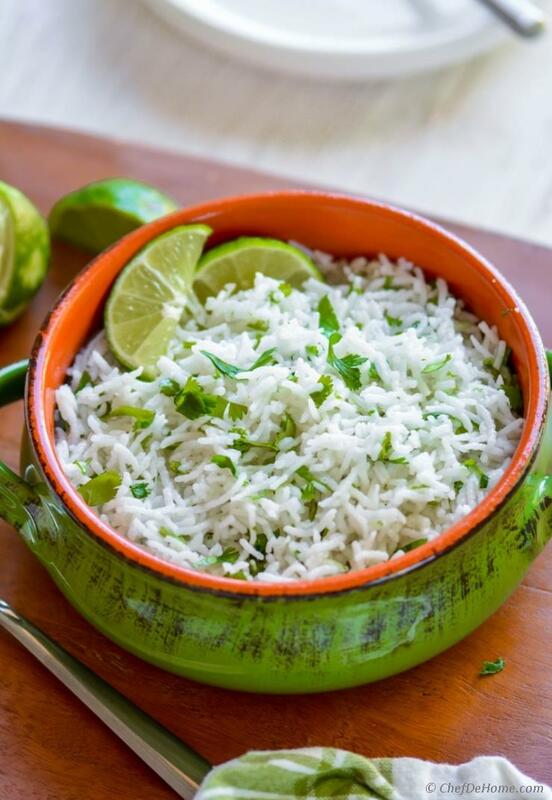 A splash of lemon or lime can really take rice to new flavor-profile and this simple recipe is the best example. These days, weather is in worst phase here in California. Like yesterday the day time temperature was 90 degrees and today, it is 65 degrees... A perfect recipe for falling sick and so am I form few days now. So showing very less on blog these days. I hope to catch-up with you all in few days... until then enjoy your favorite curry or stew with big bowl of Cilantro Lime Rice. Stay healthy and enjoy your day! 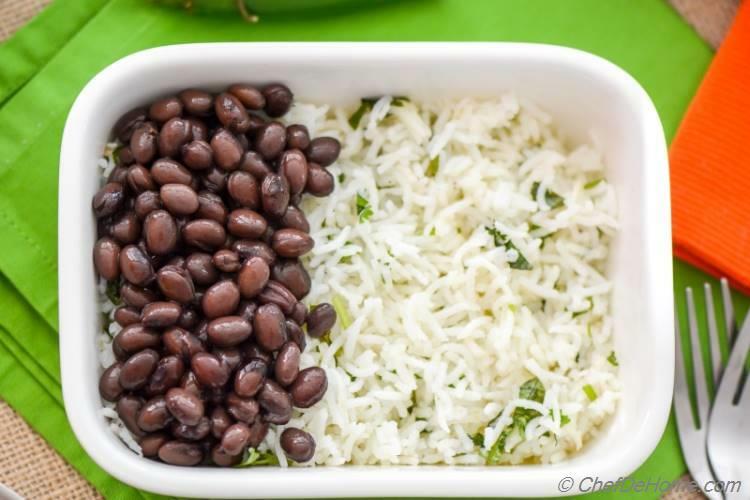 Total Time 17 minutes Prep Time 5 minutes Cook Time 12 minutes Difficulty Easy Yields 3 Cups Rice Serves 4 Notes Number of servings depend on serving size. Smart Swap Replace rice with quinoa or brown rice! 6. Cook Rice - First thing, I seldom use rice cooker to cook rice. I prefer to boil rice with 1 cup extra water (it just takes10-12 minutes, unattended). 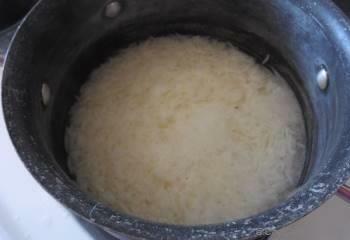 Then, I drain the extra water to get rid of some rice starch (hence a little less carbs). So, cook rice with 3 cups of water on medium heat for 8-12 minutes until just done, not mushy. Feel free to cook rice in rice cooker, per rice cooker instructions. 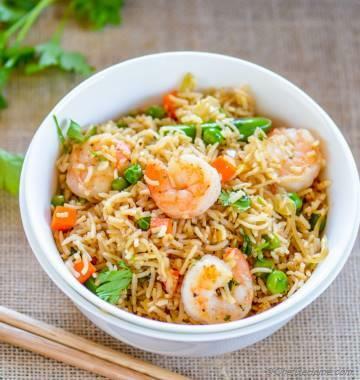 Or you can also use leftover plain steamed rice. 7. Drain the extra water and leave rice in a large bowl or spread on sheet tray to cool down quickly. (for about 5-8 minutes). In meantime, you can chop cilantro and squeeze lime juice. 8. 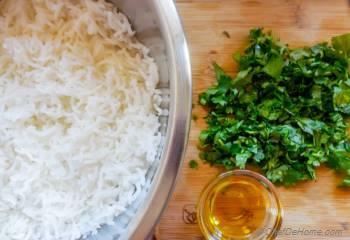 Add chopped cilantro, salt, lime juice, and oil to the bowl with rice. 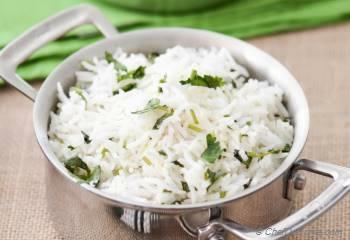 Fluff rice gently with a long fork or fold-in gently using a slotted spoon. Chipotle's Cilantro Rice use more oil than I have suggested here. If you prefer rice glistening like in chipotle, you need at-least 1 more tbsp (3 tbsp total) of oil. Feel free to try with a small batch. For the taste, I think, just 2 tbsp are okay, you don't need more oil. 9. 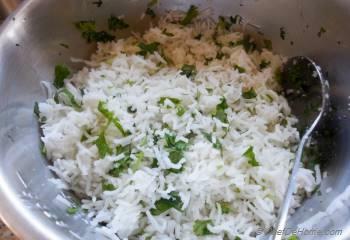 Cilantro Lime Rice are ready! How easy was that?? ?